Read this travel experience from Lhasa to Beijing: The Worlds Highest Rail Route. The article covers all about the train journey. "Unbelievable! … So, we will seriously travel through the roof of the world?" "So it says, doesn't it?" My husband and I were having this conversation at 3 o'clock in the morning while planning a trip to Tibet. So it all began. We started our research on Tibet railways through the internet and found a journey from Lhasa (Tibet) to Beijing (China) would take us some 41 hours, with a break at Xining (China). Flying all the way from Tibet to Beijing would have been less time consuming but then we would have missed nature. So we decided on the rail route. 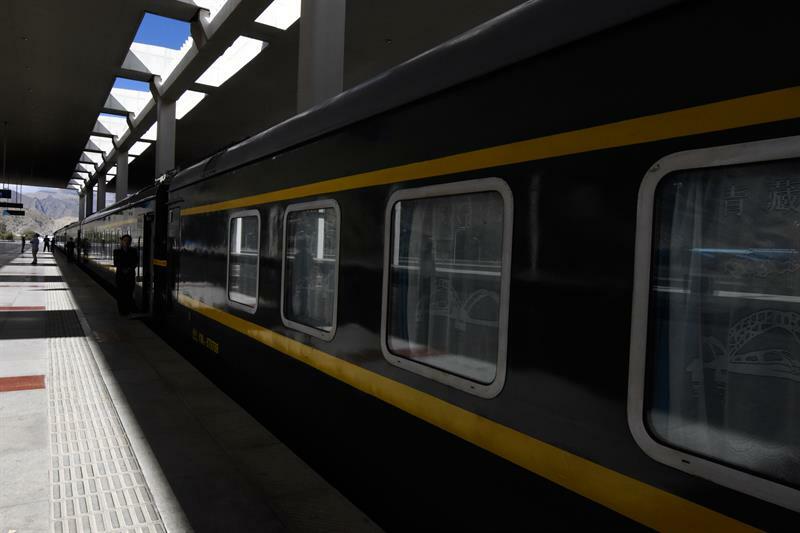 It was 11 am when the first train from Lhasa to Xining left Lhasa rail station. Ours was a hard sleeper journey. After security checking, we boarded the train, settled in our seats and looked out of the window. Wow! What a sight. We are traveling through the mountain tops. It almost seemed like floating on cloud nine. Picturesque did not even begin to describe the scenes that were passing by. It was simply awesome. We were at the level of the snow-capped mountain peaks with the clouds floating way below. The village homes looked like tiny dolls houses. Farms and land looked pretty from the height at which we were traveling. 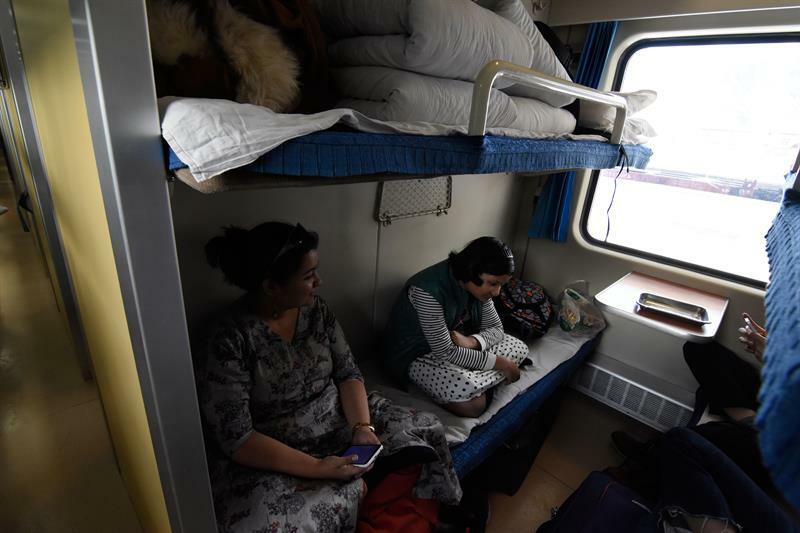 Tibet railways have various types of seats, there are hard and soft sleepers and then again there are sitting as well as standing arrangements. The hard sleepers have three-tier sleeping arrangement while the soft sleepers are two tiers. All through the train, there is heating arrangement and oxygen in each and every cubicle. Tibet being so cold needs a constant hot water service which the trains provide. There are boiling water taps at each end of a compartment. One can boil noodles or make ones tea with the water. Also, there are hot water taps if you need to wash flasks or even your faces. The water from the cold water taps is biting cold. So it's advisable to use the hot water for washing and cleaning. Tibet has a very different landscape. Here the mountains are rugged. Greenery is almost non-existent, but there are a plethora of colours. The mountains turn from purple to brown and from brown to golden. The sun rays on such mountains make it so much more appealing to our eyes. And then the sun sets, creating an unbelievable colour canvas on the sky. From raging golden it turns to a palish yellow and the more reddish hue sets in giving a flame-like orange touch to the otherwise colorful mountains. At last, the sun sets leaving a pink hue, and then the world is captured in darkness. It is then that the train compartment comes in view. We have nothing else to do but play indoor games and read books. The travelers are still sitting by the corridor windows, a book in their hands simply reading. Nature still passes by them this time without much appreciation. Soft sleeper compartments are very comfortable. With dressers and bath stations all included. Moreover, there is also a restaurant car. So you don't need to cook your own food. The Chinese people love to travel all packed. They carry their own food and drinks. However, the railway restaurant has a wonderful chine menu. We had a yummy dinner with roasted duck and soupy noodle. As the train approached Beijing nature took its toll. Now it was a busy city scene with high rises, heavy traffics and congested roads. Gone were the mountains and the colour that they carried. Our nature bubble was burst by the humdrum of the city life. But the memory of those snow filled mountains sans trees, of the clouds floating by waving at us, still catches us at the most unbecoming moments. Candid yet informative... Richly conveys the experience with personal feel and detailed observation. Loved it. Very well written! I could visualize the scenery through your words. Breathtaking experience indeed! Fantastic writing . Loved the post. Felt like we were part of the team too. But I feel more photos of the outside landscape would have made the article more lively and engaging.